First time I have ever seen them land in our garden. A Bridge Through The Reeds. Right now it is trying to snow! Yes I know, it is spring, but this is New England and it is much like the Old Country. You never know when the weather will change! For several days now we have had rain, the creek below us is in flood, and the header streams are flowing. Cattail Pond is overflowing, and a tree has fallen into the pond! I decided to check it out during a break in the rain, and I snuck up on a pair of wood ducks on the pond. I only have a little digital camera now with limited zoom! Resource site for Clubs in Victoria, Australia. Gun Powder Allowances for each State. Australia. Vic 5 Kilos but you have to have a storage distance of 10 meters from a source of ignition but it does not apply to an ignition source needed to fire an explosive charge. W. Aust. 4 Kilos but no more than 2 Kilos may be stored in any one container. We specialize in historically accurate clothing and accessories. 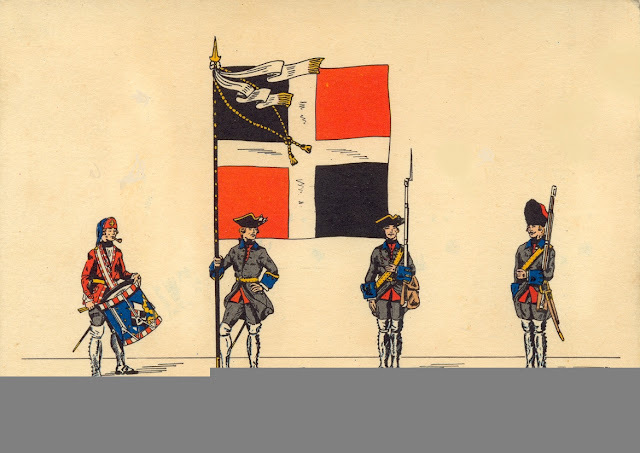 I Supply Roman, 17th century, Napoleonic and ACW clothing and equipment. Special items made to order. All things medieval, mythological, magical, wicca, gothic and the macabre. We make drums from all eras, including turned medieval tabor style. Maker of Daggers, alloy warhammers & maces, bronze maces, C14th Pewter belts, jewellery & armour. Commissions for medieval & fantasy clothing. Sewing kits and medieval style dolls. Supplying quality munitions armour to the re-enactor community. We design and create bespoke historical garments of high quality and accuracy. Working in natural fibres from leather to silk we specialise in the fashions of Western Europe between the 14th and 16th centuries. WWII, ACW, Napoleonic-specializing in French. Southern Cross Free Trappers Australia. ALHF. 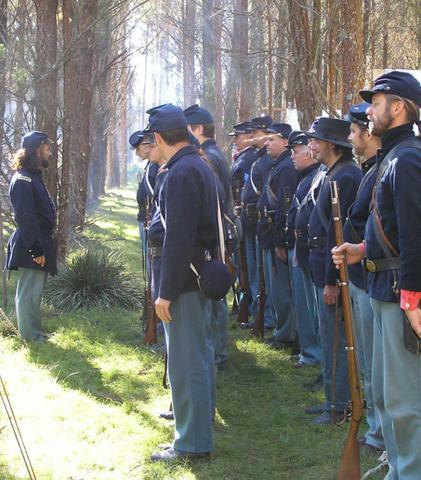 Australasian Living History Federation. 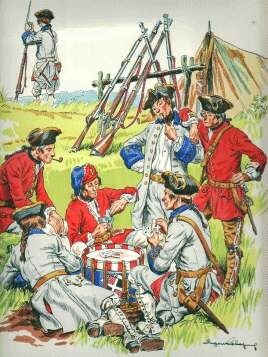 The Pike and Musket Society Australia. Most of our members live in or near Sydney, and some in Melbourne and Newcastle. New England Colonial living History Group 1680-1760. Armidale NSW Australia. ARLHO. 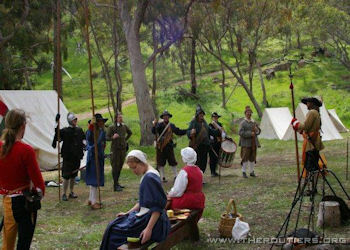 Australian Register of Living History Organisations. 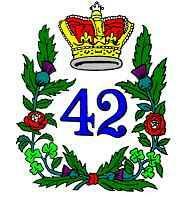 The 42nd Royal Highland Regiment 1815 Australia Inc.
American Civil War Group In Australia. Prickett's Fort Video. A Link. Tools of the trade. The knife, The axe, and The gun. The Axe, The Knife, And The Gun. When choosing your tools you must think about what the tool will be used for. Small axes are not used for cutting down large trees, if you need to do that then you need to pack along a felling axe. My tomahawk/axe is used to construct shelters, make traps, for recreational throwing, for self-defence, for hunting if needs be, and sometimes as an aid in butchering game. I don’t need it for cutting firewood; there are plenty of ways to get firewood without having to use an axe. So what do I need? I need a light axe that I can easily make and fit a new helve to if one should get broken. That is it. I don’t care if it is slightly easier to cut saplings down & split kindling with a heavier hatchet, I don’t need the extra weight and I don’t need to split kindling wood. This choice has nothing to do with me living in Australia; I would make the same choice if I lived in the UK or in America. For me, it is simply the right tool for the job. What do I need a knife for? Self-defence, skinning and butchering game, eating meat with, cutting up food, hunting if needs be, making trap parts. Now I don’t want to use my hunting knife for making trap parts, so I carry a jack knife as well. I don’t need to split kindling wood at all, and if I did I would use my tomahawk, not hit the back of my blade with a chunk of wood! Someone said recently that it is hard to strike the right place on the end of a small piece of timber by striking it with a tomahawk. He was right, but this person also has no idea how the job should be done. You do not strike with the tomahawk blade when the target is too small, you simply place the blade on the wood and lift both wood and axe together and strike the wood on a firm surface. Knives were not originally meant to be used as an axe. You need the right tool for the job in hand. Anyone who has done a lot of hunting will tell you that it is a good idea to carry a back-up knife. I carry a legging knife because it is out of the way and easy to retrieve. A small knife like this is an excellent back-up for butchering or self-defence. The flintlock is a natural choice, either that or a gun from an earlier period or a bow. Once again you must consider what sort of game you are likely to be hunting, and in what sort of environment. I need an arm that is versatile, one that can shoot anything from small game to large game. Small game includes birds and rabbits so I really need to be able to use small shot, swan shot, and round ball. So the gun for me is a smoothbore, and I chose a 20 gauge/.62 calibre trade fusil with a 42 inch barrel. This arm serves me well for self-defence using swan shot and ball [buck and ball] loads. The lock is also a good back-up tinderbox [fire lighting tool]. Being a smoothbore I can load this fusil faster than it takes to load a rifle, and it loads even faster again if I use paper cartridges. It is also lighter to carry than some rifles and muskets. I don’t carry a lot of lead with me because more often than not I can retrieve the shot ball from the downed game and remould it. This means that I can carry more weight in gunpowder. I don’t need to carry patch material unless I intend to shoot over long distances which I never do. I will start off on a journey carrying patch material and wads, but it is not a problem if I run out of these items. A word on hunting knives: The most commonly used hunting knife by Indians & woodsmen/woods women was the butcher knife, also known as a scalping knife. This knife was generally light with a long blade. 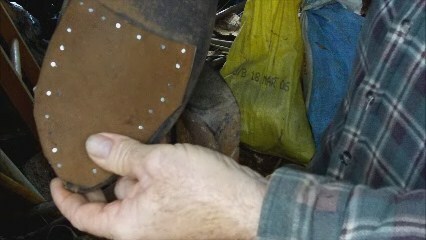 The handle was riveted with pins, not the modern rivets with heads. Usually just three pins, but this is very general and there could be more or less pins depending on the style of butcher knife. 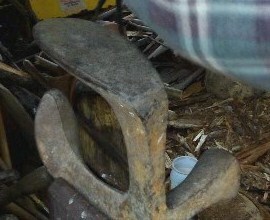 Above you can see a pinned handle and a 19th century knife handle which is riveted. This post may seem a long way from 18th century living history, but even in the 18th century some peoples were still living a very primitive lifestyle. In my opinion one needs to go back to one's rootes, or, to a primitive lifestyle to understand who & what we really are. Some people find it easy to learn primitive skills & adapt to a primitive lifestyle. Others simply can't grasp it at all & are totally lost once they leave the city. Hunters & trappers are very much in tune with their environment & even foraging comes naturally to these people. These are the type of people who were able to survive in wilderness areas during the 17th & 18th centuries. Many of them may have come from the slums in London, but their attitude toward survival was primitive, they had primitive instincts. Some survivalists today collect their modern gear & gadgets & strongly defend their choices of gear against more more primitive implements, claiming that this modern gear gives them an edge. Where as I agree that modern medicine is a definate plus & life saver, I still believe that the answere to survival lies in more primitve equipment that also teaches us a greater number of extremely important primitive skills. Fort Hunter Excavation Update. A Link. To Make an Onion Pie. A Link. Lighting a Tudor fire without matches! Using A Knife In The Kitchen. Pirate Fiction Just For Fun. Jack Be nimble, Jack Be Quick, Jack Jump Over The candle Stick. Making Dipped Candles. I just made a video on making dipped candles, plus a little history. But it is not out on DVD yet so I will just use stills here. Never heat wax or large amounts of tallow directly over a fire or on a stove top. It is inflammable & can burst into flame when heated in this manner. Always use a double kettle & melt the wax with the container in a kettle of water. Not too much water, about half-way up the side of the container of wax. You don't want water splashing into the wax because it will spit hot wax everywhere! Dip the wicks in the melted wax then lay them aside or hang them to set. If you have a number of candle sticks you can simply alternate. The candle stick with three wicks tied on. Keep dipping the wicks/candles & letting them cool between dips until you get the size you want. Smaller candles are needed for the candle holder on a tinderlighter. Short stubby ones are good to keep in your fire bag for drying out damp kindling. To Sweeten Tainted Meat. A Link. Tales From The Green Valley Episode 1 Part 1. Tales From The Green Valley Episode 1 Part 2. Tales From The Green Valley. Episode 7 Part1. Tales From The Green Valley. Episode 7 Part 2. How to Smoor an Old Rabbit. A Link. 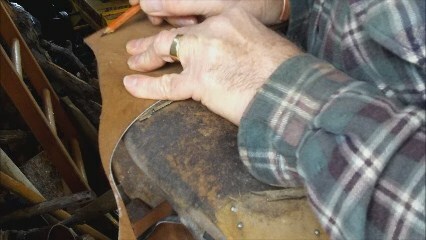 Cobbling Soles On Moccasins & Shoes..
Cobbling Soles on Moccasins & Shoes. 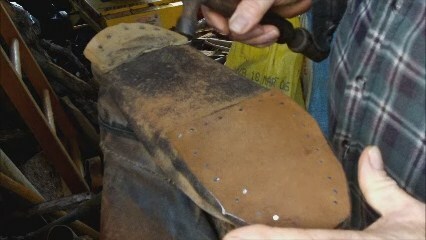 Cobbling soles on woodland Indian moccasins is not traditional, but it is an easy way to attach & replace extra soles. The moccasins I wear in the woods have extra soles stitched on, but my work moccasins have cobbled soles because the soles wear out faster & need replacing more often. My iron last secured in my post vice. You need 2 inner soles plus the outer sole or half soles. One inner sole to attach the outer sole to, & one inner sole to protect the feet against any shoe tacks that may not be laying flat. 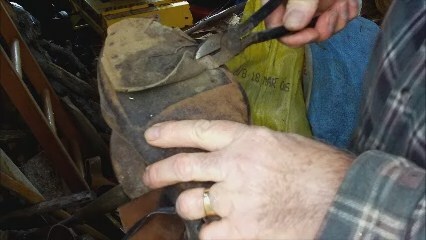 This half sole is worn through & is being pulled off prior to replacement. 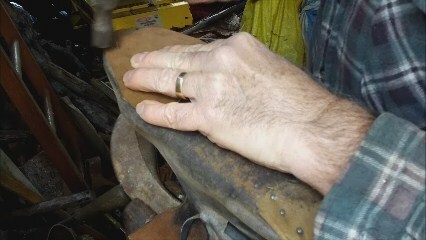 A new half sole is marked for cutting to shape. I cut the sole to shape with my jack knife. Now it needs tacking in place. 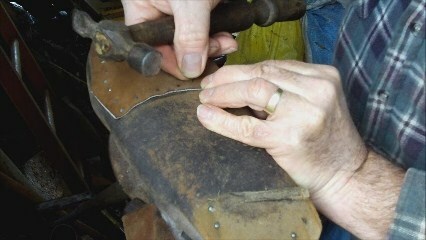 I start hammering in shoe tacks from the toe back, alternating from one side to the other to keep the sole even. 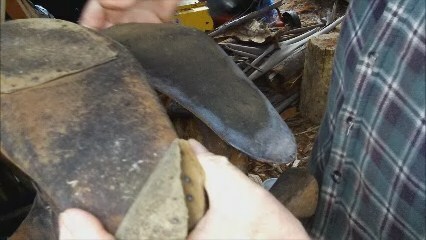 The finished half-sole tacked in place. When repairing the heel I just turn the moccasin round on the last & push the toe of the last into the heel of the moccasin, rather than using the smaller heel dolly on the last. 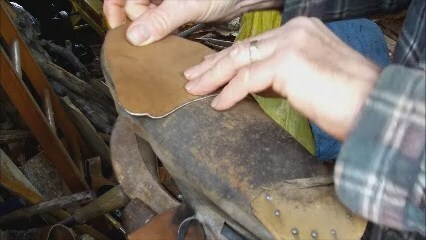 But for shoes you will need to turn the iron last round & use the heel dolly to repair the heel. 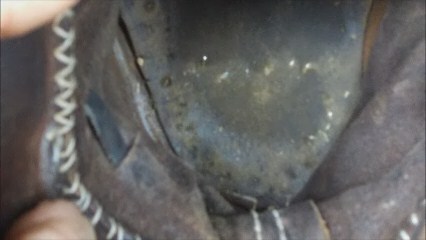 Here you can see the tacks inside the moccasin where they are bent over at the tips when they are hammered through the leather & come in contact with the iron last. All that is left to do now is to replace the second inner sole, which just slips in to the moccasin for extra protection for your feet. To Clean the Brass of your Arms. A Link. Knapping Flint For Building. A PDF. Children In The 18th Century.